On this, the shortest day of the year in the northern hemisphere, Bookman and I have a holiday celebration. As many of you know, Bookman is a wizard in the kitchen and does all the cooking. Except on Winter Solstice. Way back in the murky past when we began celebrating Solstice, Bookman, being in the retail biz, often had to work during the day. Therefore in order to have a special celebration dinner, I had to dust off my cooking skills and whip it all together. The whole process actually begins two to three weeks before Solstice when I comb through recipes looking for something just right. We never have anything that we have eaten before, the recipes are always entirely new. As you can imagine this might sometimes backfire like the year I thought Salisbury tofu steaks would be great. It was so bad the leftovers went into the trash. Or the time I attempted to make little tarts with filo, something I had never used before. Instead of lovely little flute-edged pastry cups filled with fruit, I served a mashed up crumble. It tasted good though, so that was something. Sometimes parts of the meal end up being integrated into the regular dinner repertoire. Black bean burgers when we were still newish vegans were a miracle that saved us from having to continue to buy those horrible frozen burger patties from the grocery store. And the year I made breakfast for dinner that included vegan sausage. Bookman has since put his own spin on it and has turned it into an even tastier sausage but he used the recipe to create his own version of hot dogs too. As Bookman tried really hard to stay out of the kitchen today and only help when I asked, he kept saying things like, “oh this gives me ideas.” Happy words. This year’s dinner was flavorful and pretty simple. In recent years I’ve spent all day standing in the kitchen chopping, chopping, chopping, mixing, simmering, stirring, chopping some more. This year there was very little chopping and only a moderate amount of grating. 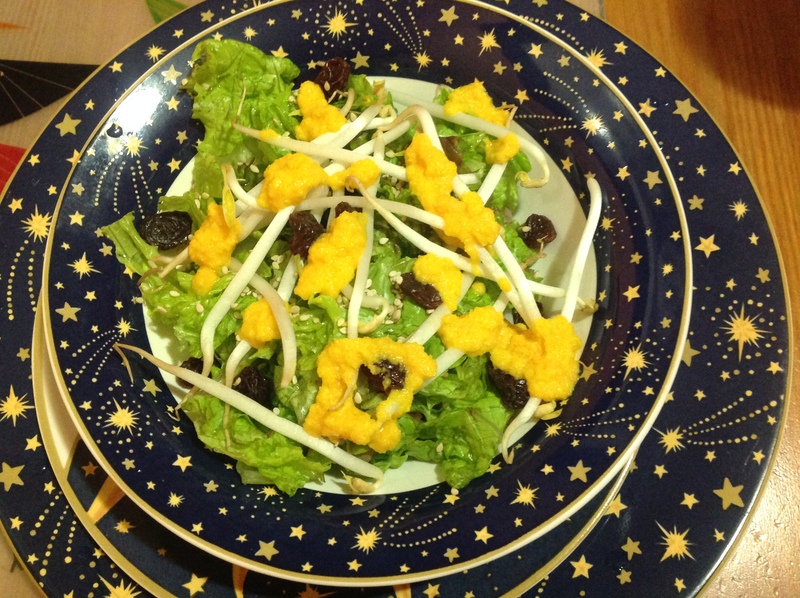 The meal begins with a green salad: lettuce, mung bean sprouts, raisins and a sprinkling of sesame seeds with “Ninja ginger carrot” dressing. Bookman was sitting at the kitchen table keeping me company while I had the food processor going blending this up. Why is it called “Ninja”? he asked. At that moment I had stopped the blending to open the lid and check on the progress. I turned around, I can’t see! I’m blind! I cried, tears streaming down my face. I’d been Ninja-ed by the potent miasma of fresh ginger, white onion and vinegar that wafted out when I opened the food processor. That answered Bookman’s question. Lucky for us, eating it was a different matter. The main course for the evening was tempeh katsu. This is tempeh marinated in ginger and garlic, soy sauce and mirin all day, then battered and coated in sesame seeds and panko and baked for half an hour. 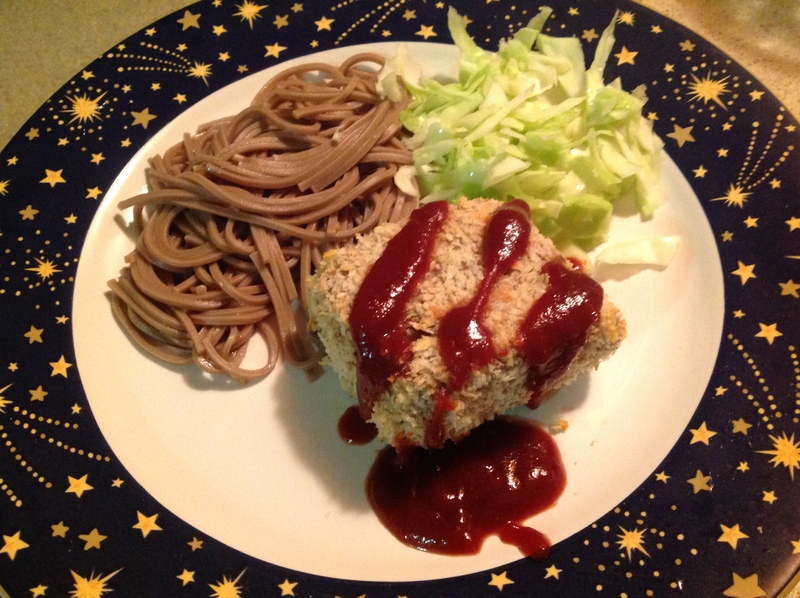 Served with homemade tonkatsu sauce, buckwheat soba noodles and green cabbage with lemon. We’ve had tempeh many times before but never cooked like this. We have also had soba noodles before. Nonetheless, I had no idea what this was going to taste like. Wow, was it good! And it was easy to make too. This is a meal that will definitely be making more appearances. Dessert. 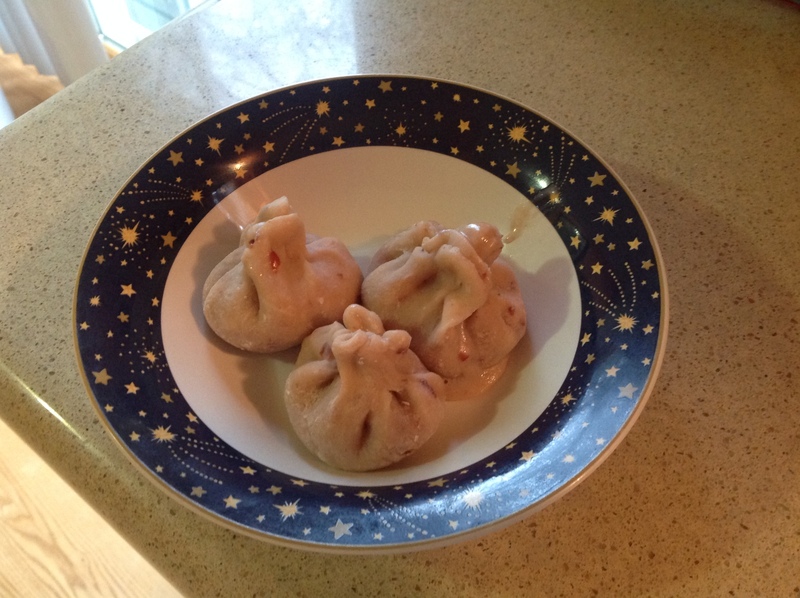 In keeping with the Japanese flavors, I made red bean vanilla ice cream mochi dumplings. Bookman made the coconut ice cream from scratch yesterday. This morning I stirred in mashed sweetened red (adzuki) beans. I made the mochi dough in the microwave. The dough gets cut out in little circles and then wrapped around a small scoop of the ice cream and put back in the freezer. We’ve had adzuki beans before but not like this. We’ve had mochi before too that we bought at the store and then puffed up into sticky treats in the microwave. These little dumplings were so simple and so very tasty. Paired with a dark roast coffee it was pretty close to heaven. And of course there are leftovers of everything for dinner again tomorrow. In honor of the Winter Solstice the weather tried to snow but could not decide whether it was snow, sleet or rain so it kept changing back and forth all day. It is odd “warm” weather we are having. But at least we got a little snow. No bonfires in the city but we lit a candle at dinner to call back the sun. And now, ever so slowly, the days will start to get longer again. It has been a nice day; relaxing and cooking with Bookman and sharing a delicious meal together. The best kind of day. The best kind of celebration. My wife and I also celebrate this day/night every year. It was the day we were married a long time ago. Our meal was rather different, as you might imagine and while it was cooking, we listed to the Messiah and played scrabble. Richard, ah yes! What a wonderful day to be married on. I hope you had a very happy anniversary! Happy to hear you had a successful solstice dinner. It sounded interesting… And leftovers, well they are always good!!!! Happy Solstice! For some odd reason. after all these years, it never stuck with me that YOU were the one who cooked the solstice feast. But I definitely remember that you feast, and I was waiting for your post about it. For me, the Christmas season doesn’t officially begin until you post about solstice. I (and Bob, who really wants us to be vegetarians, more than I) would love the recipe for tempeh cats (“easy” is always an attraction for me when looking at recipes). Happy Solstice, Stefanie! Your dinner sounds amazing. Relaxing and enjoying good food, now that’s what I call a good way to celebrate. Happy solstice to you and Bookman, Stefanie! Your feast sounds lovely. Also a beautiful tradition you have. I didn’t cook anything special for the solstice tonight. I wanted to make Yule log, but we’re all sick and at 2 pm I thought, no, I’m out of time! and not enough energy to try something new. I think I will practice making them though, for next year. This year we had a little solstice celebration with just my immediate family, to say goodbye to the old year and hello to the new year. It was lovely to have the light of our candles go away and then come back to signify the sun returning. I’m learning to love the stillness and peace of winter, just not the cold. It tried to snow here today too, but nothing fell. Stefanie….I do not understand why you do not cook more often? I am sure Bookman is a great cook, but as always, you too come up with such amazing recipes…you carrot soup from last year is still legendry among my friends and I soooo have to try red bean vanilla ice cream mochi dumplings…way to go!! A very happy solstice to you and Bookman! Glad you had such a nice solstice with such a delicious vegan feast. cirtnecce, why don’t I cook more often? I don’t actually enjoy cooking at least not on a regular basis. When I only do it once a year it becomes fun but otherwise it is a chore. Bookman never finds it a chore and loves to cook so he gets the rest of the year 🙂 The dessert was so good. Sweet but not overly so. Happy Solstice to you too! Happy Solstice! Are those gorgeous plates used only for Solstice? I commented on them last year. I love all things with stars and moons. Sounds like a wonderful celebration. Your story about the Salisbury tofu steaks made me laugh. My kids still rib me about the Blue Cheese Casserole I made. After they tasted it, they started crying and begged me not to make them eat it. At first I insisted, but after I tasted it, I agreed. We ordered pizza. Some recipes just don’t work. Anyhoo, the food you made sounds and looks wonderful and the day was a success. I look forward to your Solstice posts every year. Grad, glad you got a laugh. Blue Cheese Casserole, huh? Well we have to have some failures in order to make the successes taste even better, right? Did you do a Solstice dinner this year? If so, I hope it was wonderful! This is such a nice tradition! We usually celebrate the solstice by wrapping up Christmas gifts. We did that, and listened to the sounds of big feet tromping in during the night (kids home from college). Jeanne, thanks! Sounds like your own Solstice was very enjoyable too! Happy Solstice! Looks like a yummy meal–would you be willing to share your recipe for black bean burgers and the mochi dumplings? It’s so cool that you celebrate the day this way. It has been mild but grey and rainy here. I hear that we are in for a big blast of really cold air–just in time for break. Oh well–easier to sleep in and not have to worry about waiting for the bus at the crack of dawn–right? I know it is nice to think of being on an upward slant now with day slowly becoming longer, but you know how winter is reall jus getting into the swing of things! Good staying inside and reading weather! Have a fantastic break–and I am more than happy to beging the Burgess whenever–maybe just after Christmas if it works for you? Danielle, Thanks! I always think the longer days are a mostly just compensation for the frigid months of January and February! Polaris, thanks. The recipe comes from a cookbook called Vegan Eats World. It’s got lots of great international recipes in it. I highly recommend it! Looks tasty, and I adore those celestial plates!